Appointment of General Taban Deng in place of Riek Machar threatens to reignite civil war in Africa's youngest nation. South Sudanese President Salva Kiir has replaced his vice president and rival Riek Machar following a sharp surge in violence between the government and opposition fighters in the five-year-old country. The move to replace Machar on Monday could potentially undermine last year's peace deal and reignite war in Africa's youngest nation. According to a decree "for the appointment of the first vice president of the republic of South Sudan", read on the country's national broadcaster, Kiir said he had appointed General Taban Deng to the post. Machar fled the capital, Juba, last week after a new outbreak of violence threatened to send South Sudan back to all-out civil war. 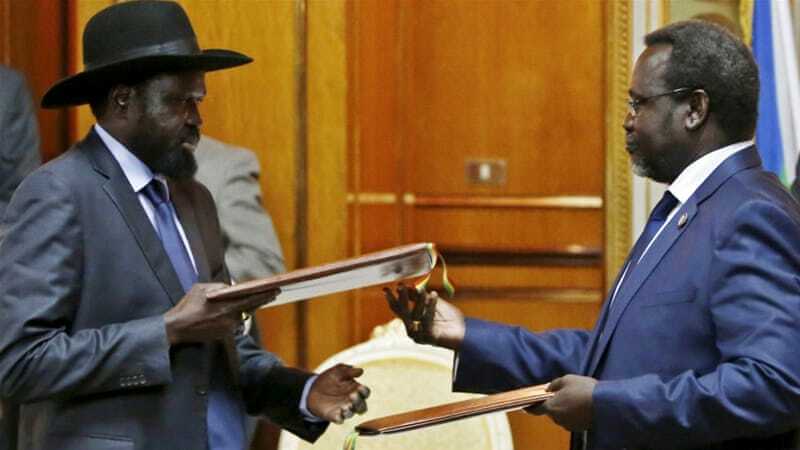 On Thursday, Machar was given a Saturday afternoon deadline by Kiir to return to Juba and work together towards rebuilding peace - the two had signed a peace agreement late last year under which Machar was once again made vice president. But with Machar still missing, his party convened on Saturday in Juba and came up with a resolution to replace him with Deng, who is now set to become acting first vice president. Nyarji Roman, a spokesman close to Machar who is also in hiding, said the move was a "conspiracy" to overthrow Machar, who has reportedly dismissed Deng. The country descended into conflict in December 2013 after Kiir accused Machar of plotting a coup. Civil war broke out when soldiers from Kiir's Dinka ethnic group disarmed and targeted troops of Machar's Nuer ethnic group. Machar and commanders loyal to him fled to the countryside, and tens of thousands of people died in the conflict that followed. Many civilians also starved. The pair of rivals signed a peace agreement late last year, under which Machar was once again made vice president. The latest setbacks are putting the fragile peace plan at risk. "I think there are ways in which there could be a renegotiation of aspects of the peace agreement if there is an intention to implement it," said Johnson. "We don't yet know if there's intention to implement it, or if there is a desire to scrap it entirely." Meanwhile, thousands have been displaced in the wake of the heavy fighting. More than 8,300 refugees fled the violence and crossed into neighbouring Uganda in a single day this week, setting a one-day record for this year, UN officials said on Friday. The refugees, nearly all women and children, were escaping stepped-up fighting between forces loyal to Kiir and those backing Machar, the UN High Commissioner for Refugees said. Throughout the week, more than 26,000 South Sudanese travelled south to Uganda, pushing the limits of humanitarian groups working in the region, UNHCR said.